I've always loved Starburst, apart from the wrapping as they can be a little fiddly when desperate for a sugar fix. These sweet or sour fruit chews come in three spine tingling flavours. 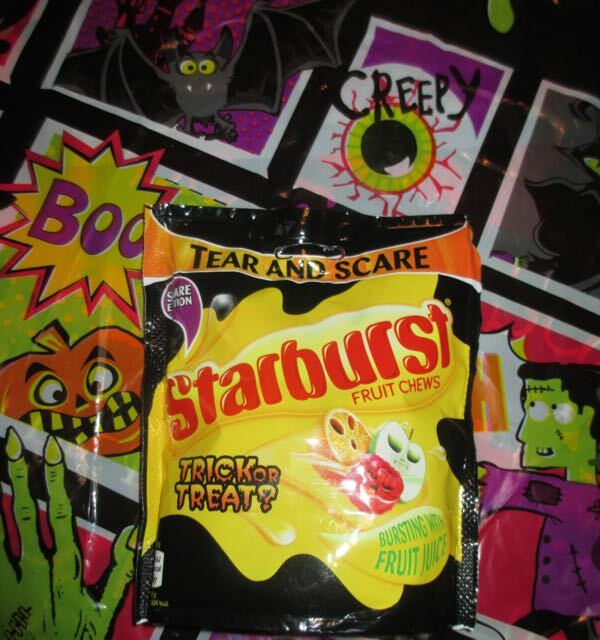 On opening the bag I was faced with the wrapped fruit chews, although Starburst are traditionally not as sticky as other fruit chews. I have to admit that I just wanted at them like a rapid monster on Halloween night. The were four colours; Orange Ghoul had a nice tangy orange flavour with some more sour than others. The dark pink was Raging Raspberry and had a really tasty sour raspberry flavour. The Evil Apple came in two colours. There was a good sour apple flavour in the green packet, whilst in the bright red packet there was a light fruity apple chew. I'd certainly recommend sharing these out at Halloween parties and to Trick or Treaters. Just make sure they have nails and patience for the fiddly wrappers. 165g bag with 182 calories per 45g serving, having 3.3g of fat and 37g of sugar. Ingredients (see photograph) have 5% fruit juice, with no artificial colours or flavours, and are suitable for vegetarians.